You see that title up there? Don't Forget To Share..... I could pretty much leave this post with that being the only thing said and you'd understand what I mean. But I won't just leave it at that. I'll actually take a minute or two to suggest ways you can share your craft with others the way that I have started doing. Once you start this "sharing thing" I think you'll find it is very addictive and rewarding in so many ways. Join a hometown photography club or an online group. You might find one by searching on Facebook for starters. Once you join this group and have introduced yourself start by asking questions about the group that can help you determine if there are members who would enjoy/benefit from having a mentor. I recently joined a local photography group on Facebook and after a short period of time watching decided to see if anyone wanted to meet up and "talk shop". I was blown away at the level of excitement I received for offering to host a meetup/photowalk. There were a lot of members who are new to photography and love it, but haven't had anyone to help them along in their learning. And I (as should you) consider it a big honor to be in a position where I can help educate people. So number one is easy...Set up a meet/ photowalk. A mother and daughter who participated in a walk I hosted in 2011. 2. When you create content... SHARE IT! Put that photo out there for the world to see, encourage people to ask questions about how you captured that image, what inspired you, how you found that location or lit that model...SHARE SHARE SHARE! And when they do ask those questions (which they will!) don't be afraid to "give away your secrets" because if you won't share them? Someone else will, and you will have turned someone off from your work by not being a helpful peer. 3. This goes back to #2, you remember that one right? SHARE? So you figured out a cool technique for processing an image, or a cool way to light a subject? Now sit down and write a tutorial, or if you have the ability, make a video of your technique and share it on Youtube or your local Facebook group....Or better yet, BOTH! 4. Donate your services to those who would love them...But cannot afford them. Every year at various times there are local portrait events in which you have the opportunity to provide someone (a person or a family) with a portrait that would normally be beyond their reach. Everyone deserves to have their memories preserved in a beautiful portrait, but not everyone has the means to make it happen. But YOU have the means to make it happen for them. All you need to do is do a Google search for Charity portrait events. And if there isn't anything local..Make one! 5. This one is my favorite, and I saved it for last because well you know? Save the best for last? I wish to implore upon you the importance of the next generation of photographers and their need for someone to encourage them and help them out with our art. Take some time to get your own kids involved, or find out how you can start a community program to get kids out shooting. 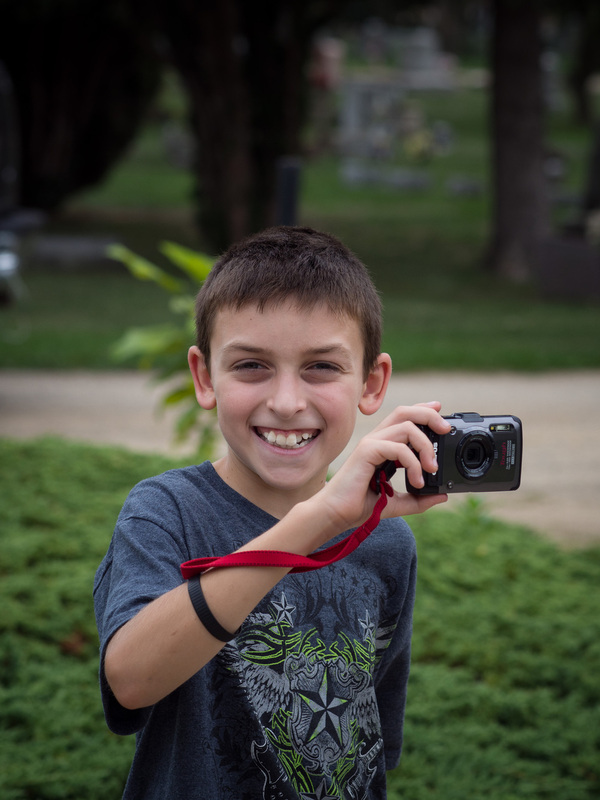 Don't be afraid to reach out to local camera shops and manufacturers with your aspirations to get kids involved. There is something so incredible about watching a child take their first photo and the expression they get when they see that image. My son Mason on his first day out with a Olympus Tough TG-1. Take care friends. And I hope to hear how YOU have taken the initiative to help others with their photography. And remember to SHARE!